Terminal pads serve two main purposes. First, they act as intermediate points for attaching ribbon leads of thin gage wire to heavier instrumentation wires. Second, they provide stress relief to strain gage systems. When the heavy instrumentation wire moves, the terminal pad protects the strain gage. OMEGA’s TT300 cement is a heat-cured, two-part epoxy adhesive which can be used to bond polyimide backed strain gages for strain measurement up to 200°C (392°F). 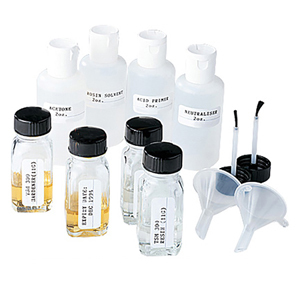 Each TT300 kit contains 2 bottles of resin and hardener which are premeasured to insure proper mixing proportions. To use, simply pour one bottle of hardener into one bottle of resin and shake for one minute. A bottle each of hardener and resin produce approximately 3 /4 oz. of adhesive. The shelf life of the resin-hardener mixture is six weeks at room temperature. The shelf life of the unmixed components is indefinite, provided the bottles are kept tightly sealed. Each TT300 kit includes 2 oz. of Acetone, Acid Primer, Neutralizer and Rosin Solvent for cleaning and preparing the surface, as well as two funnels and two cap brushes. SG496 and SG401 are general purpose cold-curing one-part glues. They are the easiest and most commonly used adhesive for strain gages. They cure in one minute, but require 24 hours to set. SG401 is an ethyl-based cyanoacrylate and SG496 is a methyl-based cyanoacrylate. There is a one-year shelf life at cool room temperature, but increased shelf life can be obtained by cold storage. The glue temperature range is -65 to 180°F (-54 to 82°C). NOTE: Additional Hazardous Materials carrier handling surcharges may apply for adhesive products on this page. You will be contacted by Internet Sales to confirm after the order is placed.